It is good to be familiar with both the laundry symbols, what is stated on the garment label, especially if it is new and has not yet entered the washing machine. This will make it easier to choose the correct degrees and you will know the exact content of matter in percentage. 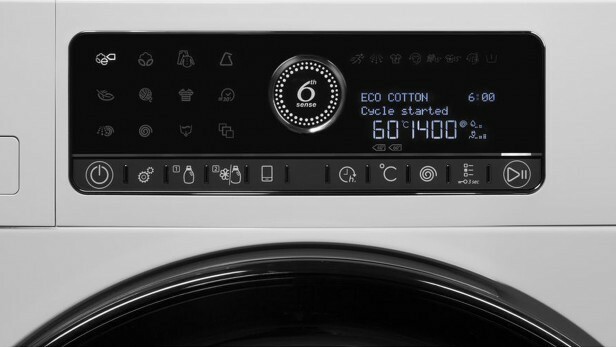 But don't forget to have a look on the washing machine symbols on the display regularly too. So you are one step ahead of the possibility that your beautiful dress or blouse will remain just a memory for you. Sometimes hand washing or dry cleaning is recommended, which means you certainly should not put them in the washing machine and make experiments. Newer models have more delicate programs, but in order not to be at risk, try hand washing or, eventually, run a manual wash program. Everything is a matter of personal choice. It would be good when you buy a new washing machine to focus on getting to know it from a technical point of view. Study each button carefully so you do not miss something you own just because you are not aware of how to use it. Temperature selection panel - this function is designed to adjust the temperature or change it. There is an indicator that shows the set temperature on the display. 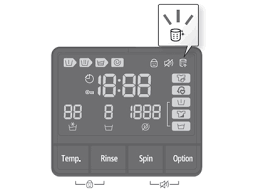 When selecting a new program, the temperature indicator shows the maximum temperature. To reduce the temperature, you have to use the button for this purpose and it will gradually decrease. If the program has not yet reached the water warming step, you can change the temperature without switching the machine to pause mode. Centrifuge selection panel - this option gives you the option to change the default spin speed. You can monitor the speed and adjust to the desired level on the display. By pressing the right button, you will gradually decrease the speed. You can also select a "no spin" function. It has the same icon but is scrawled. At its option, you will deactivate the spin. It is most often canceled in delicate tissues. The cancellation indicator will give you a clear signal. Only the drain phase is possible. Door lock - the door is always locked when the washing machine is started, but the locking system does not allow the door to open even in the event of a malfunction. It is used as a precaution when checking the machine for what is happening inside. The lamp blinks until the water level is established and only then lights up completely and the door unlocks. In case of high water levels, it remains locked. However, if the lamp turns off and you have to open the door in an emergency, you can try it out by dropping the program or as described in the instructions for using and maintaining your washing machine. Be careful only with the spin speed of the drum, the water level and the temperature, so as not to cause any major washing machine damage. In many models there is a child lock mechanism. This way, you can be completely safe for the safe operation of the machine in your home. Pre-wash / Pre-wash - Used for heavily soiled clothing, which is not enough for the respective program only. By pre-washing you will be more sure that your garment will come out clean and you will not have to wash it again. 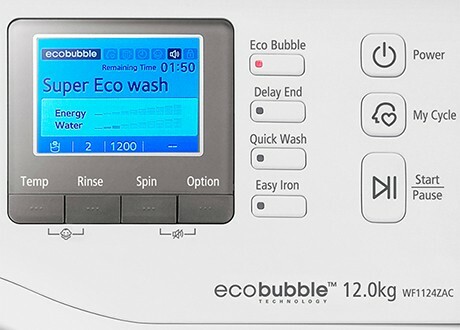 This will save energy, water, detergent and time. For tulle and curtains, it is advisable not to use a detergent in this pre-wash. Postponement - this icon, representing a clock, allows you to wash on economy mode. You can charge and set the home assistant to turn on at night when energy is cheaper. The setting is proceeded after you have selected the program. For programs such as "Rinse + Centrifuge", "Rinse + Rotate," etc. it does not work. The delay delay time must be longer than the program selected, as the delay time is the actual time the program will run. For example, if the time for the selected program is 2:28, delay time should be between 03:00 and 24:00. So once you press the launch, the countdown will begin and the washing machine will be activated at the desired time. Screen / Display - the small window is what shows everything that happens in the process. All you do by pressing certain buttons is shown there. Sometimes mistakes and malfunctions occur and illustrate it in order to familiarize you with and guide you how to react. There is a small amount of damage that you can do for yourself thanks to the display. If you can not fix it afterwards, then you could contact an appliance repair specialist who would also be interested in what it was when the problem occurred. Cotton wash - 90 ° C - for white and colored fabrics that are normally or heavily soiled. In everyday life, this program is seldom used because of its high degrees, but is a good option for more persistent dirt, such as oil and others. The cycle is longer to remove the dirt. Cotton ESO - 60 ° C - 40 ° C - suitable for white and colored cotton and linen fabrics that do not cause staining and are normally soiled. The program is longer but the electricity and water consumption is minimized compared to other cotton fabric programs. Bed sheets, lingerie, tablecloths are most often used here. With a 'time remaining' model, the duration of the program may be automatically reduced at a later stage if, for example, your quantity of clothing is less expensive and does not occupy the full capacity. This will give you total savings. Synthetic material - 60 ° C and 40 ° C - suitable for synthetic and mixed fabrics. The programs are divided into two because of different levels of contamination of clothes. The cycle is much shorter than the cotton washing program. For curtains and tulle, Synthetic 40 ° C is recommended with a prewash function to avoid the strong crunch that is very easy with these fabrics. Delicate fabrics - 20 ° C - Used for fabrics such as acrylic, viscose and polyester with normal dirt. Provides support for the need for sensitive washing with gentle action without any interstitial spin compared to the Synthetic program. Washing baby clothes - the child's clothes require anti-allergy and hygienic laundry, so if you have such a program on your washing machine, it is best to use it. It is long lasting, intense and long lasting for better results. Sports laundry - Many of the programs have a special program for your sports clothes that can keep their good looks for a long time. If your laundry is adapted to the fabrics of your sports team, use it. Wool / hand wash - 30 ° C or 40 ° C - washable wool clothes designed for a low-grade washing machine, hand wash or delicate fabrics with a handwash symbol. For some laundries the program is combined, and in others it is divided into two different ones. The program is sparing and can cancel you into the unpleasant occupation. Silk 30 ° C - silk is a very delicate fabric, so it is separated into an individual section, where synthetic fibers can be mixed and mixed. You can also run a relatively small amount, but it is advisable to follow the program. Short cycle program - Used for clothes that are worn once or are very slightly dirty. You can refresh your cotton and synthetic fabrics with this extremely short, low-grade program. Mixed program - this program is special for cotton, artificial and lightweight mixed fabrics. 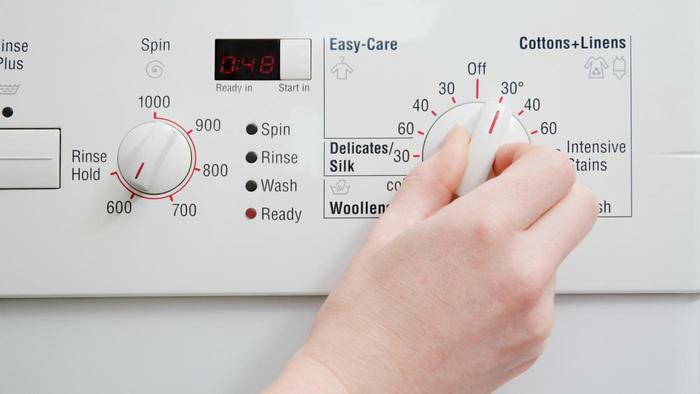 You can set a reduction in energy consumption and you will not have to sort the clothes. Special programs - such as rinsing, extra centrifuging + pump or other. Each model can have an individual name, but the principle is the same. Extra rinse is a good feature for people with laundry allergies or for safer rinse of baby clothes. It is activated before the process starts, and depending on the model, you have a different maximum number of rinses. Most often during rinse, the indicator flashes and turns off alone after the end. Centrifugation + pump is the ideal way for extra centrifuge or drain water from the washing machine. Each brand creates different designs according to its considerations and probably for a higher degree of originality. Symbols and names are in most cases identical. According to the price difference, some are less expensive than others. No matter what budget you have set aside and what you are targeting, the principle is almost the same - your clothes are washed according to a program you choose, in which the degrees and fabrics you have sorted are important. Be careful only with the color distribution because there are no universal buttons there.